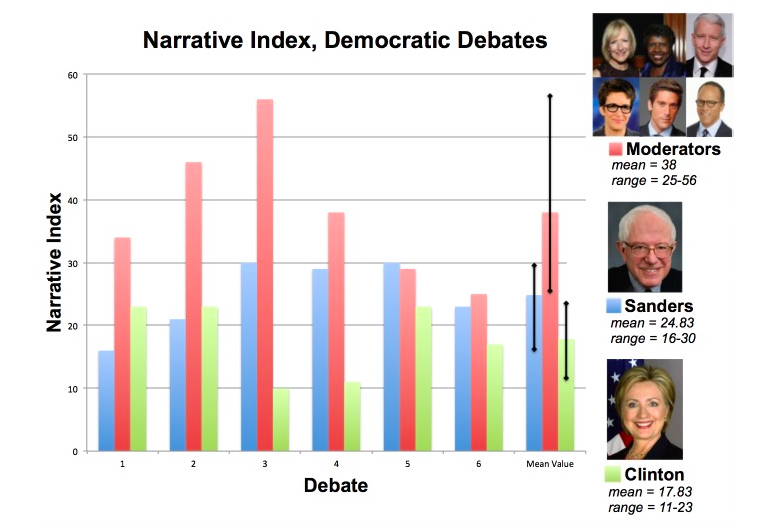 Good debate moderators usually score all the way up to the 50’s for their Narrative Index (BUT/AND ratio). Their job is to “advance the narrative” which results in them squaring off the candidates by using the word “but” frequently — as in “Your opponent says this, BUT you say …” Lester Holt’s reviews were so-so for his job as moderator of the first debate. His Narrative Index was a meager 17. Kind of figures. GOOD MODERATORS INTERROGATE: For the Democrat debates last spring, every group of moderators scored 25 or higher, putting Lester Holt at a level below them. A good moderator repeatedly points out “you said this BUT your opponent says this — THEREFORE?” The result is good moderators end up with a high Narrative Index score (BUTs to ANDs). RADDATZ: Secretary Clinton, the Department of Health and Human Services says more than 17 million Americans who are not insured now have health coverage because of Obamacare. BUT for Americans who already had health insurance the cost has gone up 27 percent in the last five years while deductibles are up 67 percent, health care costs are rising faster than many Americans can manage. What’s broken in Obamacare that needs to be fixed right now? MUIR: You have said it’s your goal not to raise taxes on families making under $200,000 a year a goal. BUT can you say that’s a promise as you stand here tonight? RADDATZ: Secretary Clinton, first ladies, as you well know, have used their position to work on important causes like literacy and drug abuse. BUT they also supervise the menus, the flowers, the holiday ornaments and White House decor. I know you think you know where I’m going here. MUIR: As I pointed out the CEO pay, 200 percent of their time — for that family of just 2 percent. You’ve all said, “you would raise the minimum wage.” BUT Senator Sanders what else – speak to that household tonight. 20 years, just a 2 percent raise, how as president would you get them a raise right away? 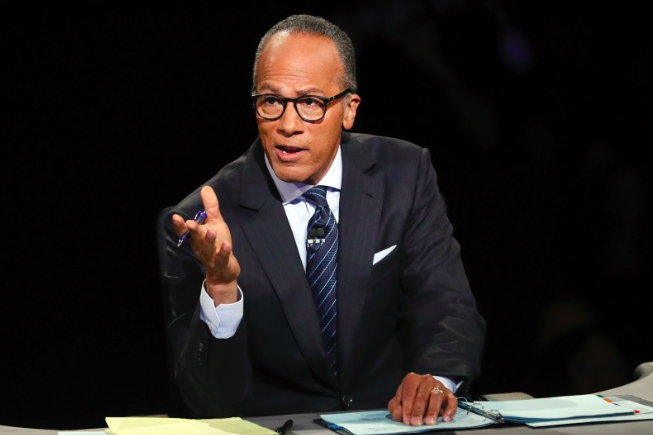 Lester Holt, as moderator of the first Presidential Debate last week received mixed reviews (that was actually the headline in People Magazine). Aside from allowing Trump to run wild, he just didn’t do much advancing of the narrative. And so, not surprisingly, his Narrative Index was a mere 17. By the way, if you’re wondering about the two candidates — Trump scored a 25, Hillary a 20. Both of those values were about average. Which is how most people felt about their performances. Neither of them delivered a blazing, inspired vision for the nation. They both just jabbed and defended in a fairly directionless way. They actually started off in the normal fashion with Hillary launching a barrage of “and, and, and” statements as Trump presented the singular narrative of how China and other countries are having their way with us. But the divide quickly vanished as Trump lost his composure and Hillary got feisty.